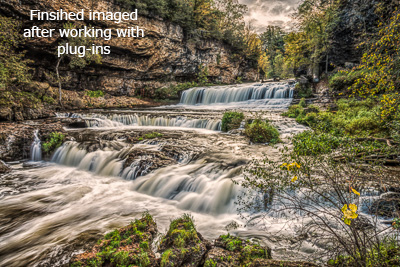 High Dynamic Range Photography (HDR) is used to expand the Dynamic Range of your camera. Your eyes are able to see such a wide dynamic range (about 24 f/stops) compared to your camera (11 to 15 f/stops). So to extend the range of what the camera sees you need to take multiple frames so that you can expand the range of the sensor. This is usually accomplished by taking a normal exposure and then one or more over exposure and underexposure. My normal HDR is one stop over and 1 stop under plus the normal. If it is an extremely contrasty day I will go to multiple exposure starting at 1 stop, then 2 stops over and the same under. (Using a tripod does help to keep the images lined up but is not absolutely necessary.) What you want to accomplish is to have detail in your highlight areas and in the black areas. 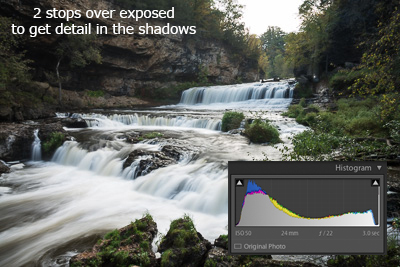 You can use the histogram to make sure you have detail in those areas. Make sure the blacks have detail and the white have detail which would show on the histogram as not coming up to the edge of either side. An interesting note that the Nikon’s have a slightly larger dynamic range than Canon, although pretty close. Nikon and Sony are close since Nikon uses Sony sensors. Once you have your exposures, you then need to take them into a program to combine them together for one image. You can use Photoshop, or you can use a separate program, my favorite is Photomatix (http://www.hdrsoft.com). There are others out there, Nik (https://www.google.com/nikcollection/) has one that works well and so do a lot of other companies, just google HDR and you will find them. Import the images into the program and it will create a single image with the expanded dynamic range. I actually shoot 3 bracketed shots for most of my photography (except for sports or high speed movement). This accomplishes two things, first it gives me 3 exposures to choose from to get the best exposure, or I can merge them into a HDR image. So whenever possible I will shoot one stop over and under, plus normal on just about everything I shoot. It may take up a lot more card space and Hard-drive space, but in the long run it has its benefits. I will say that using my D800 or 810 has cut the need for HDR down because the cameras themselves have such a high dynamic range that I usually will just use the best exposure I have, but it is nice to have the option to make the HDR. So way not try shooting more HDR’s and get the benefits of the expanded dynamic range.